Pain Res Manag. 2007 Winter; 12(4): 249–258. 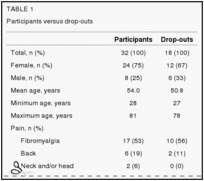 – participants and drop-outs were otherwise demographically and clinically similar (Table 1).